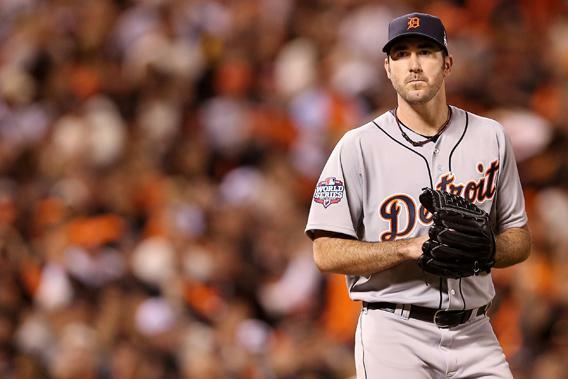 Justin Verlander contract: The grotesque rise of baseball salaries reveals everything that’s wrong with the American financial system. The grotesque rise of baseball salaries reveals everything that’s wrong with the American financial system. In the first year of his $180 million contract, pitcher Justin Verlander of the Detroit Tigers will earn $20 million—around 800 times as much as Detroit’s median household income. I’ve been a Tigers fan since I was 11 years old, and I filled scrapbooks with stories about Alan Trammell and Lou Whitaker clipped from the Detroit Free Press. Hanging on my office wall is a framed photo of Kirk Gibson celebrating his second home run in Game 5 of the 1984 World Series. Last fall, after the Giants swept the Tigers in the World Series, I insisted their championship was as illegitimate as George W. Bush’s presidency, because they’d reached the postseason with the help of Melky Cabrera’s PED use. Over the past 40 years—the period of rising economic inequality that former Slate columnist Timothy Noah called “The Great Divergence”—Americans’ incomes have not grown at all, in real dollars. But baseball players’ incomes have increased twentyfold in real dollars: the average major-league salary in 2012 was $3,213,479. The income gap between ballplayers and their fans closely resembles the rising gap between CEOs and their employees, which grew during the same period from roughly 25-to-1 to 380-to-1. Comedian Joe E. Lewis once said that rooting for the New York Yankees was like rooting for U.S. Steel. And that was when Mickey Mantle was earning $60,000 a year—12 times the median household income. Now, rooting for any team is like rooting for U.S. Steel. Even the Houston Astros, whose 25 quadruple-A players will earn less money combined than A-Rod in 2013, have a higher payroll, in real dollars, than those Yankees of the 1950s. I’m singling out professional athletes for my class envy because they’re the highest-profile beneficiaries of changes that have enriched those at the top of the economic order while impoverishing those at the bottom. The labor policies of the mid-20th century depressed the price of skilled labor while inflating the price of unskilled labor. Athletes’ bargaining power was constrained by the reserve clause, which tied a player’s rights to a single team for his entire career. At the other end of the labor market, unions represented 35 percent of private-sector workers and had their own political arm in the Democratic Party. The deregulation of the American economy that began in the 1970s has increased the salaries of professional athletes enormously while reducing those of blue-collar workers. In 1975, pitchers Andy Messersmith of the Los Angeles Dodgers and Dave McNally of the Montreal Expos appealed to arbitrator Peter Seitz to strike down baseball’s reserve clause and allow them to sell their services to the highest bidder. The Seitz decision, which was upheld by the 8th U.S. Circuit Court of Appeals, began the era of free agency in professional sports. After increasing arithmetically for the first three-quarters of the century, salaries rose geometrically during the past 25 years of the 1900s and have continued to balloon in the 2000s. Labor unions are cartels that increase their members’ salaries by bargaining collectively, thus winning a more lucrative contract than workers could negotiate on their own. Baseball players are entertainers with specialized skills. They didn’t start earning their true market value until they were allowed to negotiate individually with owners—the antithesis of collective bargaining. Marvin Miller, the former United Steelworkers of America economist who became executive director of the MLBPA, was a talent agent, not a labor boss. In 1981, both the Professional Air Traffic Controllers Organization and the MLBPA went on strike. The air-traffic controllers were fired—a disastrous event for the labor movement, as it signaled that the Reagan administration would not protect the interests of unions. Unionization is now at a 97-year low of 11.3 percent. And as this chart shows, the middle class’s share of the national income has declined at roughly the same rate as union membership. A 2002 article by Keith Sill of the Philadelphia Federal Reserve Bank calls this the “skill premium.” Sill explains that since 1970, “the wages paid to the most highly skilled workers—those who have higher levels of education, ability, or job training—have increased dramatically relative to the wages of the least skilled workers.” As inequality between baseball players and the public has grown, so has inequality among baseball players. Since 1972, the major-league minimum salary has risen from $13,500 to $480,000. But Hank Aaron earned just 15 times as much as the lowest-paid rookie. A-Rod, by contrast, makes 60 times more than the poorest major leaguer. As baseball players accumulate plutocratic riches (Rodriguez will have earned a third of $1 billion by the time his contract expires), I find myself wondering why I’m supposed to cheer for a guy earning $27.5 million a year—he’s already a winner. When I was 11, I hero-worshipped the Tigers’ shortstop because I could imagine growing up to take his place. Obviously, that’s not going to happen now. Since my past two jobs disappeared in the Great Recession, I can’t watch a professional sporting event without thinking, Most of those guys are set for life, while I’ve been buying my own health insurance for 5 1/2 years. Paying to see a baseball game feels like paying to see a tax lawyer argue in federal court or a commodities trader work the floor of the Mercantile Exchange. They’re getting rich out there, but how am I profiting from the experience? I know we’re never going back to the days when Willie Mays lived in Harlem and sold cars in the offseason, but the market forces that have overvalued ballplayers’ skills while devaluing mine have made it impossible for me to just enjoy the damn game. This, of course, is why gambling was invented: to keep us interested in sports after we’ve lost any emotional connection to the players and the teams. I have an offshore wagering account in Costa Rica. In October, I made the homer’s mistake of betting on the Tigers in Game 1 of the World Series, because I thought Verlander was invincible. This year, I decided to get my price, too—since the players can sign with the club that offers the most financial opportunity, why can’t I become a free agent? And I regret to say that, unlike Verlander, I will not be staying with the Tigers. I bet the Washington Nationals to win the National League pennant at +350, hoping a healthy Stephen Strasburg will carry them all the way. (In the American League, the Tigers are +380, a bit short for a team with no closer.) So for the 2013 season, I’m a Nats fan. And after the playoffs, I’ll be on the market again, ready to jump ship to whichever franchise offers me the best deal.